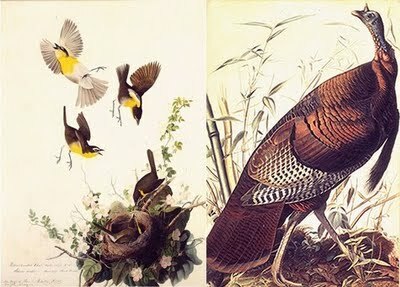 We were lucky to discover this article on the DesignSponge blog about John James Audubon. The blog, which focuses on do-it-yourself crafts and interior design, discussed the growing enthusiasm by interior designers to use nature-inspired artwork in the home. The article, which discusses birds that have become extinct since Audubon’s work, also gives readers a brief history lesson on Audubon. You can read the full article here. Plan a visit to John James Audubon State Park in Henderson, KY, which houses the world’s largest collection of Audubon artifacts and offers exhibits on the artist’s life. At the park, you can also explore the woods where Audubon studied his bird subjects from 1810-1819. The museum interprets Audubon’s life through his art and personal memorabilia, framed within a timeline of world events. The Nature Center comprises three areas: a wildlife Observation Room; the Discovery Center with hands-on exhibits; and the Learning Center, where the park naturalist and art educator conduct environmental and art programs. And a giant bird’s nest is the centerpiece of the Discovery Center, with hands-on exhibits and educational programs. Be sure to stop by the gift shop for your own Audubon bird print, postcards or other memorabilia. Park hours are March – November, 10 AM-5 PM daily and December – February, 8 AM – 4:30 PM Wednesday – Sunday.